Call any of our locations for information and orders. Black frame with white wheels. Hopper colors: Forest Green. Quickly adjusts to 4 different heights- 14, 18, 24 or 32 inches for easy loading and unloading. 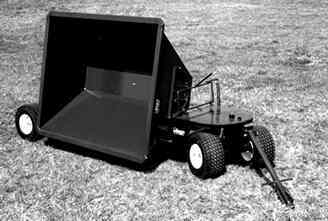 Red-E No-Tip Dump Trailers are designed to give you exceptional service with easy one-man operation. Wide tread tires protect turf, and trains of three to five units can be hauled easily. Trailers are balanced at the axle, assuring stability. Bodies are constructed of 12- gauge steel on a reinforced girder type frame of channel steel. Wheels roll on Tinken tapered roller with sealed bearings. Fifth wheel steering for maneuverability in crowded areas. Uses 1-7/8" standard ball hitch and 18 x 8.5 x 8C 6-ply rib tread pneumatic tires. The Hawl Frost Remover and Dryer will remove the frost and leave the ground dry at the approximate rate of 1 foot in 3 or 4 hours. A 100-lb. cylinder of gas will operate the burner for a period of 35 to 40 hours. As it removes the frost, the controlled application of heat conditions the soil for digging. Dirt removed is dry and will remain unfrozen for hours. The well-insulated canopy* leaves the ground around graveside dry and firm. *The canopy or heat retainer is constructed with a heavy 16-gauge sheet-steel outer wall covering - a heavily reinforced, approved insulating material. The outside steel shell is flanged to form a firm base and to protect the insulation. 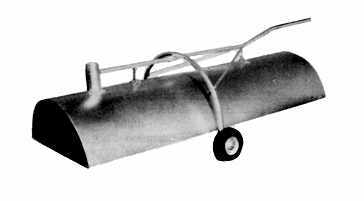 The carrier is made of tubular steel and is specially designed to provide an easy method of transporting both the canopy and gas cylinder from roadside to graveside. The heat source is a contractors model burner, capable of producing 500,000 BTUs using readily available LP Baffled Gas. It is made to operate out-of-doors and will not be affected by weather conditions. OSHA required automatic, emergency shut off valve supplied with each unit. 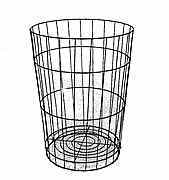 A lightweight yet sturdy trash basket for flower disposal. Made of 12- gauge vertical wires spaced 2- 1/4' and five 8-gauge supporting rings. Basket stands 26' tall, has a holding capacity off 3.4 cu. feet and weighs 4 lbs. Available in enameled green finish. Strong nylon netting is bonded between two heavy duty layers of PVC. This design makes the material tough yet flexible. Punctures won't tear or spread. Excellent resistance to caustics, oxidation and mildew. Material cleans up easily and lasts longer. 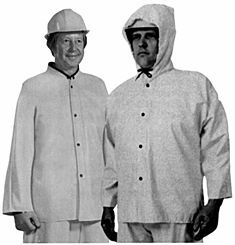 Full sized hood, with nylon drawstring, is dielectrically welded to jacket. Elasticized suspenders with non-corrosive buckles for length adjustment. For velvet collar jacket. Attaches with non-corrosive snaps. Nylon drawstring. (not pictured) One size fits all.